How Is The Beast Funded? Ring game players at Americas Cardroom receive points toward The Beast leaderboard based on their play. At the end of the week, the top finishers receive cash prizes and satellite tournament entries. The total amount awarded each week through The Beast depends on the amount of volume put in by players, so it varies a bit. Each leaderboard period runs from Saturday through Friday. The top monetary prizes are $2,500 while the next step down is $1,000. $250 and $100 credits round out the cash portion of the awards although someone right on the cusp of a higher payout level usually gets an amount intermediate between the two values. In addition, the highest-ranked competitors gain a seat into the $50 + $5 The Beast $1K Cage Satellite, which awards at least 10 tickets to the Wednesday night $1,050 The Cage tournament. Most of the time, more than 200 people receive prizes. There are separate pools for awarding cash and tourney entries, so it’s possible for a given individual to receive both money and a tournament ticket or to get just one or the other in any particular week. A small portion of the rake is diverted toward The Beast. This is the case in every ring game at Americas Cardroom with the exception of heads-up tables. This portion of the rake is deducted from the normal amount the house takes from each pot. Players don’t have to pay anything extra. $0.02 of every $0.06 in rake funds The Beast with caps of $0.04 if only two people are dealt into a hand, $0.08 for three players and $0.24 if there are four or more people at the table. For every $0.02 that you contribute in Beast rake (according to the weighted contributed rake formula), you will get one point on the leaderboard. You can check your position at any time within the poker client. Click on the “leaderboard” link for The Beast in the poker lobby. Your web browser will open up to the appropriate webpage. Payouts from the Beast will add on top of any bonuses you’re currently clearing. Look at our Americas Cardroom bonus code page for further info on the bonuses available to you. Don’t already have an account? 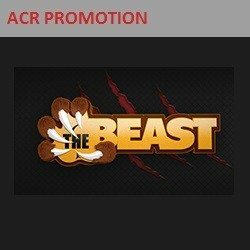 Join ACR here!